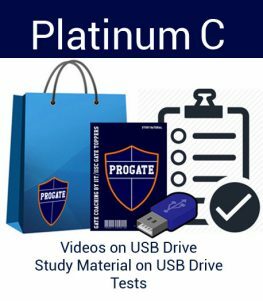 Categories: ProGATE Courses, GATE 2018 Courses, Platinum (Videos on USB). Tags: e-copy-study-material, tests, videos. The ProGATE Platinum Distance Learning Course is your ultimate prep tool for cracking the GATE or any other allied exam. Powered by 300+ IIT / IISc GATE Toppers, this course will provide you with complete learning and assessment requirements. Consisting of all the components as listed above, it will be a constant mentor and guide you during your GATE preparation. Be it the video lectures, the study material, the tests, you will see constant improvement in your study. 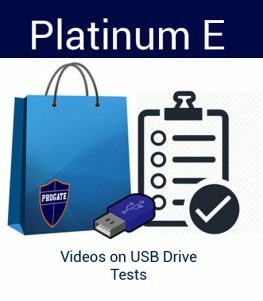 The validity of the USB videos & the online tests is till 28th February 2018. 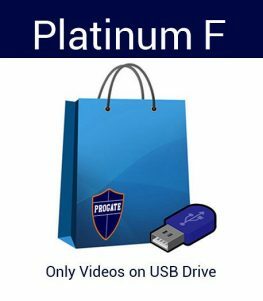 You can use the USB drive as a regular USB drive after expiry. In case you wish to extend the validity, you can get in touch with us. The discounted pricing is only valid till the end of this month.